Triad provides roofing repair & replacement services for both residential and commercial properties. Our staff is fully trained & experienced to handle any project regardless of the size of your property. The roofing experts at Triad are equipped to handle any type of roof repair that you may have. We will complete a detailed inspection and provide you with a proper solution to resolve your issue. If your roof is repairable, it may extend the useful life of your roof and enable you to put off the expense of a full roof replacement. It’s important to make sure your roof repair needs are addressed as soon as you know you have a problem. Otherwise what could be a minor repair could turn into a much more severe problem. If you property has sustained any type of storm damage including windstorm, hail, tornado, hurricane then give Triad a call to handle all your needs. We can provide emergency roofing repairs, tarping & board up services to mitigate your damages even before your insurance company sends out an adjuster . We can also provide a full evaluation of the damages to present to your insurance carrier. We work closely with your adjuster to repair the damages to your home or business in an expedited time frame following any type of storm damage to your roof. If you have experienced any type of storm damages to your roof, give us a call to provide immediate assistance. We will be ready to repair your property when you need us. 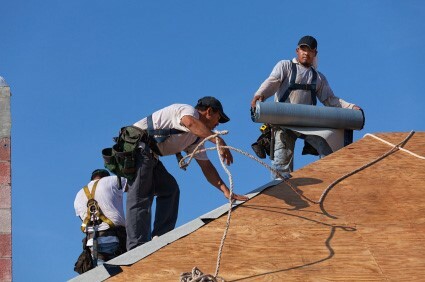 When the time comes to complete a roof replacement, you can trust the Triad team to provide you with an excellent job. Our roof replacement services include shingles, metal, tile & flat roofing products and other types of commercial roofing. We install all types of roofing materials and are proud to be a Tamko Pro Certified Contractor. We can handle your new construction project. Whether you are a homeowner or a builder, contact Triad to provide you with a new construction roofing proposal. Our Team will be ready to dry in your roof as soon as the framing has been completed to prevent any long term exposure to the elements. We will install the products that are specified by your builder or design professional and provide you with a transferrable 10 year workmanship warranty.